Vegetables or fruit (e.g. apples, pears, quinces, carrots etc.) 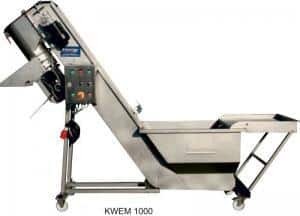 are washed and elevated in a Kreuzmayr Elevator / Washer / Grinder machine KWEM 1000, 2000, 3000 or 5500, and ground with the directly attached grinding mill. The mash produced in this process is directly applied to the belt press. An automatic monitoring process prevents an excessive filling of the belt press. Stone fruit such as cherries, plums, apricots or peaches must have their stones removed before pressing. This is done in a Kreuzmayr pitting machine (KEP 650/1000/1500) in order to be able to produce clear juice without stone particles. The fruit and vegetables are emptied into the washing tank of the KWEM (by means of Bin Tipper GKE). In the washing tank, the fruit is washed. With KWEM 3000 / 5500, and an intensive cleaning result is achieved by means of water jet, circulation pump and grass collector as well as the air bubbles created by the blower. The cleaned fruit is elevated and cleaned again with water jet nozzles. It is then ground in the directly attached grinding mill and conveyed into the dosing box of the belt press. 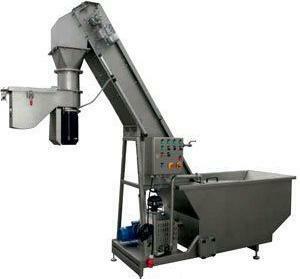 The elevator / washing / grinding machine is delivered as a plugin machine. After being brought into the pressing room, leveling, filling of the washing tank and being connected to the power and water supply, the machine is ready to be operated. After the work has been completed, the machine can be cleaned by one person without any problems. Deflector plates in the washing tank can be dismantled easily without the need for tools.